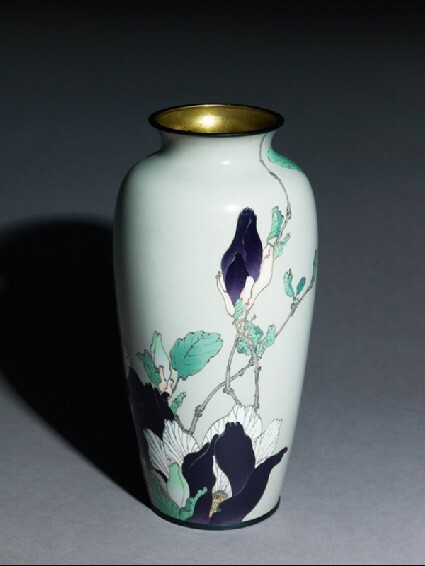 Cloisonné enamel baluster vase with a large spray of purple, pink and white magnolias on a buff ground. This vase is almost identical to a pair exhibited by Gonda Hirosuke in 1900 at the Exposition Internationale in Paris, and illustrated in the catalogue (unnumbered and unpaginated) allowing us to be certain of our attribution. The conformation of the design to the shape demonstrates that not all Japanese crafts deserved the slating they recieved at the exhibition (see the Kinkōzan vase, [EA1997.41]).